Interview With Kelly Vincent: The Female Electrician. In an industry saturated by males we thought we’d invite electrician Kelly Vincent, owner and employee of Kelly Electrics, to give her own insight into the world of a sparky. 30 or 40 years ago the proposition of a female electrician would have been laughed at but a lot has changed since then, and for the better. Kelly is part of a small contingent of female tradeswomen looking to provide an equally as good service as their male counterparts; whilst changing old fashioned attitudes as they do it. Not only did Kelly enter a male dominant industry but she also gave up her job to pursue her career change. The apparent lack of women in the trade industry as well as a list of great testimonials from her early clients saw Kelly attract admirers from afar. 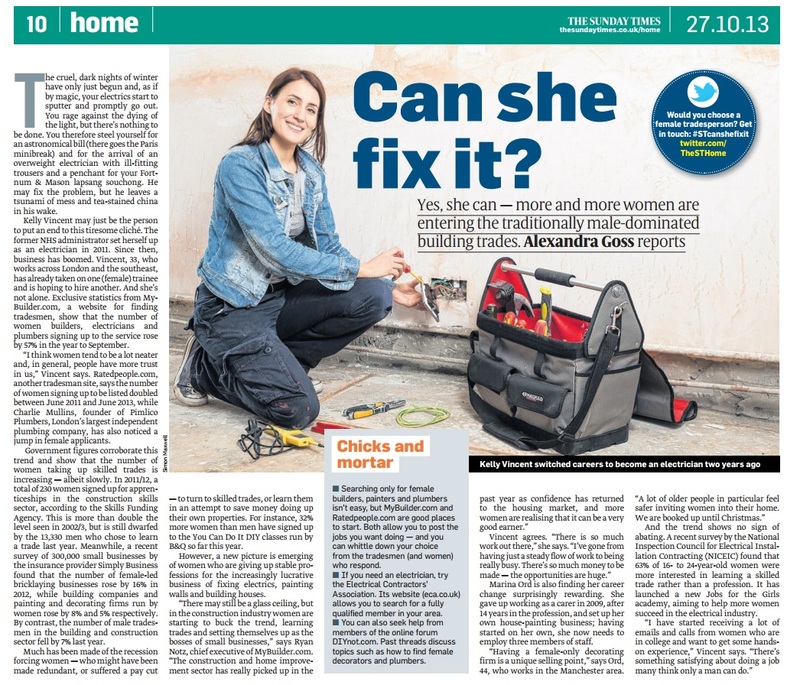 Some of those that wanted to know more included national press with her story being discussed in The Times newspaper (pictured) and home improvement magazine Homebuilding & Renovating. Being a female electrician isn’t her only asset, you have to be good at what you do, and Kelly is. Since launching Kelly Electrics in 2013 she’s earned herself real recognition, so much so that in 2014 she was nominated as a finalist in both the ‘Britain’s Top Tradesman’ and ‘Women In Construction’ awards. Kelly Electrics has also seen a new addition to the team with another female electrician Sarah Watsham joining ranks. 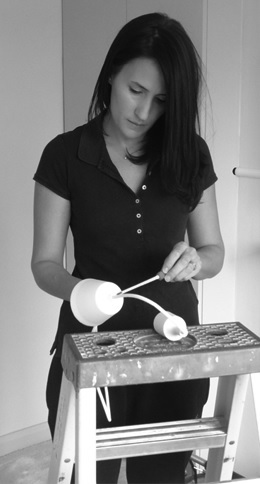 Sarah is a specialist in solving electrical problems and a stickler for perfection. Seeing as Kelly challenges the status-quo of a male leading industry and poses inspirational values for like-minded women to follow, we thought it was only right to invite her to take part in an interview. Providing a quality service is her primary aim but there’s more to this story than your average electrician firm. So let’s see if she can change the perception of stout traditionalists that believe tradework is a men only job! 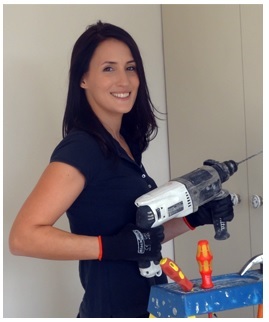 Q&A With: Kelly Vincent, The Female Electrician. I read that you were once an administrator for the NHS but you decided to change your career path – what influenced your decision and was this brave step difficult to execute? Yes, I was working in administration for the NHS for 10 years but I didn’t feel challenged enough. I knew that I wanted to do something practical and I didn’t want to be confined to an office space. My father is a building contractor and I used to go out on site with him. I enjoyed helping him painting and decorating, and I loved the hands-on side of the job. However, painting wasn’t for me. Again I didn’t feel challenged mentally, so my father suggested electrics because I was good at problem solving and the technical side appealed to me. I looked into courses, and made the decision to train to become an Electrician. It was very daunting but I signed up to a three year course at college. When I turned up for my first class I felt so intimidated by a classroom full of 16-18 year old boys, so I backed out. Despite this experience being very nerve racking, I knew I wanted to enter the trade, so I went for an intensive 9 month course at an adult training centre – TradeSkills4u. Although the students were more my age group, they were all males. I was still frightened but this time I pushed all the anxiety out of my head and walked through the door to my first class. I absolutely loved learning and training, from this moment I knew it was for me and I haven’t looked back since! With a few other trades to select from, what was it about being an electrician that attracted you? I initially thought about plumbing but I didn’t like the thought of working with toilets and water. Carpentry never appealed to me, probably because I’ve never enjoyed building things. Yet I was always attracted to that hands-on work and with electrics the technical side of circuit and lighting design really connected with me. I’ve always been a creative person and I thought I could use this to help transform people’s homes through the recommendation of lighting. There are so many styles and effects you can create with the right lighting installed! I read a statistic that 97% of trade workers are male. Considering the industry is so male dominant was it daunting or did bucking the trend excite you? Definitely both! Starting out was extremely daunting, I had never seen or heard of a female trades person before, and all the courses I looked into were full of men. But I enjoyed working on site with my dad and his tradesmen and I never experienced negativity from any of them so the prospect excited me at the same time. Once I was qualified and competent I wanted to reach out to other women to show them how much fun it was and demonstrate that females can be successful tradespeople too. That’s when I started going around secondary schools and local communities talking about what I do. I did this to highlight the alternative opportunities out there for women. What are your thoughts regarding gender equality in the workplace and in particular the trade industry? There is certainly a change occurring. Despite never having met a female trades person prior to starting the job, in the last 6 years I have come across lots of female plumbers, and I get approached by young girls asking to join me for work experience or apprenticeship programmes. When I was growing up pursuing a career in trades wasn’t an option available to me, but now more and more girls are becoming engineers and expressing interests in typically male roles. I think it’s amazing, social media has a big part to play in gender equality. I see a lot of information coming through about successful female engineers and it’s inspiring for other women to see that this is a viable option. There is still a long way to go but it’s definitely getting better. I do feel strongly though that women aren’t necessarily ‘better’ at the job than men and I don’t want people to think that’s how I feel, but we can definitely do the job as good as anyone else. Have you ever taken pleasure in shutting up male chauvinists who spout sexist remarks before or during you work? Funnily enough I have received one chauvinistic comment from a much older Electrician, you know the kind – stuck in their old ways and don’t move with the times. He saw me turn up on site and he spouted “What are you doing here? This is a man’s world.” I was gobsmacked, and timidly smiled (I was only a trainee at that point and if I remember rightly it may have been my first week on the job). Thankfully my male boss proudly shouted back “not any more it isn’t, she’s more qualified than you are.” It felt good to have him stand up for me when I lacked the confidence to confront his prejudice. Nowadays when I turn up on site people are still surprised to see us getting dirty and stuck in to the job, but other tradesmen are always really nice. We get a lot of guys running over to help us carry our tools to the job or see us chasing a wall and want to jump in to help. Maybe there’s an underlying feeling that women shouldn’t have to do this kind of work, but I don’t take it to heart, because I’m sure it’s good intentions and I thank them for their kindness. After all, men like coming to our rescue don’t they – it’s old fashioned, but it’s harmless! Are there any traits that you believe makes a female electrician a better choice than a male electrician? Having worked with a lot of tradesmen I will say I have a more caring approach, I listen carefully to what the customer wants and try to come up with ideas that will be practical as well as pretty. I do feel that women have a natural caring trait which in turn makes females an appealing choice. Feedback from our own customers suggest that me and the girls make it easier for them to ask questions, I feel it’s important for our clients to understand the work we are carrying out. I think a lot of people feel intimidated by tradespeople and are fearful of being shut down when they want a greater understanding of the work at hand or they want explanations to a problem. Women are natural home-makers, well all the women in my life are anyway! We treat our clients home as if we were working in our own homes and people respect that, especially when they have families at home. Having said that, I have worked with some excellent male electricians who are equally as considerate as us! Can you name three good things and three bad things about being an electrician? Getting Stuck In: For me, there’s something very satisfying about getting real dirty and doing a hard day’s work. Logic: Problem solving is fantastic, sometimes fault finding can be difficult but when you find it and fix it you really feel like you’ve achieved something. Networking: I love meeting new clients, hearing their stories, meeting their families, which I get to do every single day! There are so many interesting people out there with amazing stories to tell. Unpredictable Hours: I can often book in a job that I estimate will take 3 hours but actually turns out to take a lot longer. This means I get home later than planned, which can annoyingly interfere with social plans. Rouge Electricians: I have seen some terrible jobs done in people’s homes. Uncovering bad work and having to show them is an awful feeling (although being able to fix it and giving them peace of mind is a good feeling). Garden Lighting: It’s a fantastic job to do in the summer/spring/autumn but we always get a massive influx of customers needing their garden or security lighting repaired/installed over winter. Doing intricate wiring in freezing weather, often with snow, is not nice at all! What’s the hardest job you’ve had to carry out as an electrician? Complete rewires on homes are tough, physically and mentally, but very rewarding at the end. Seeing the transformation from the start of the job, when we are first fixing, to the end of the job when we are second fixing is amazing! Installing steel armoured tails is also tough for me. I have small hands and although I have all the tools to help me, a 25mm SWA (steel wire armoured cable) is really heavy and unforgiving. Can you name any of your biggest achievements as an electrician? I have been nominated by clients and entered competitions a few times over the last few years, as a result I’ve been lucky enough to have been shortlisted for all of them. 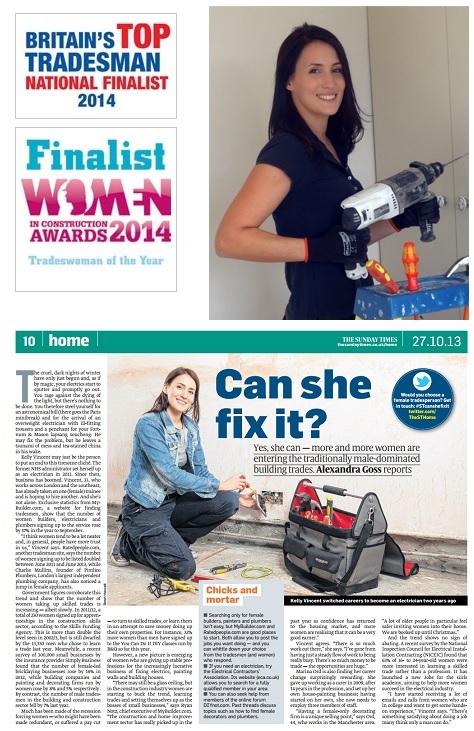 In March 2014 I was shortlisted as Tradeswoman of the Year in the Women in Construction Awards. In October 2014 I was a national finalist in Britain’s Top Tradesman which was held at Wembley Stadium. I was one of 10 finalists and I was picked for my dedication in encouraging females into the trade. It felt amazing to be recognised for the work we do! And just a month ago I was shortlisted as Best Tradeswoman in the Best Business Women’s Awards in Hertfordshire. I met some amazing women at the award ceremonies and I am honoured to have got through to the finals. What does Kelly Electrics have in the pipeline? At the moment I’m training a new budding female Electrician, Eleanor White. There’s nothing I love more than being able to share my success and teach everything I’ve been lucky enough to learn to other females who are wishing to break into the industry. Eleanor is a pleasure to work with and she’s doing really well! Now I have two full time electricians and I’m hoping to build an entire team of female electricians… so watch this space! Direct Trade Supplies stock a vast range of electrical equipment – have you ever used any of our brand names? I use MK and Hager frequently because their consumer units are reliable, nice to use and sold widely across the city. I have used Schneider accessories too as they have a really smart and unique design. I also like Aurora downlights because they appear sleek and give off a really nice light. One of the biggest changes in the electrical industry is the introduction of smart home technology – have you found yourself wiring more automated controls and how do you see the future home panning out? I’m really excited about smart home technology and I think it’s a brilliant move. It also contributes to energy efficiency, which I’m all about. On a whole, I still think people are more comfortable using standard ways of switching lighting, but I believe this is only because they don’t know much about smart home technology. However, smart home controls are slowly becoming more popular, particularly in the heating department where we have installed a number of thermostats which interact with smartphones. I would love to completely renovate a property and install smart home technology throughout. To be able to control the lights when you’re on holiday is a great security measure and being notified via your smartphone if any of your smoke alarms go off, alerting you of potential fires whilst away, is also brilliant! It can save lives, save homes, reduce energy bills and you can turn your lights off without getting out of bed! What’s not to love? Lovely having you Kelly, finally…. any last words? Thank you so much for inviting me to be interviewed. It’s been really nice to share my business and opinions with you! And to all you women out there reading this, if you’re thinking of changing your career but have questions – please do get in touch! I’d be happy to share my experiences with you. So if you’d like to get in touch with this bright spark for either work enquiries or advice simply jump to the Kelly Electrics website or alternatively you can find her on social media. Next Post:Interview With Tommy Walsh: The Celebrity Builder.